May 1, 2013 – Today Bolivians are celebrating May 1, “International worker’s day”. In Bolivia this date has become even more important because is the seventh anniversary of the nationalization of oil and gas that Bolivian President Evo Morales carried through on May 1, 2006. 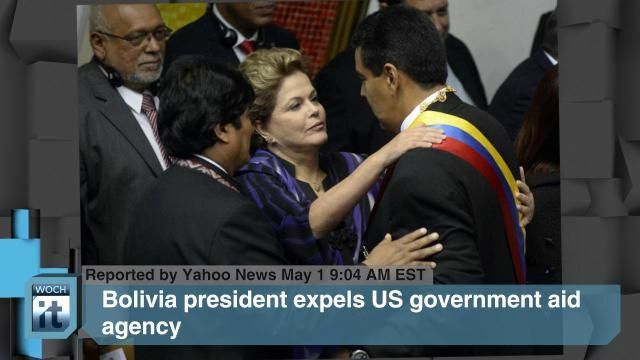 That was just a few months after he was sworn in as the first democratically elected, indigenous president of Bolivia in January 2006, winning with 54 % of the ballots. Without this sovereign and historic decision, the country would have been forced to request a loan from the International Monetary Fund, the World Bank, or other foreign entities. That is why it can be stated that without the nationalization of oil and gas all the later transformational changes in Bolivia would have not been accomplished. During the seven years prior to the nationalization (1999-2005) the government received US$2.1 billion in oil/gas revenue. After the nationalization (2006-2013) it has received eight times more: $16.09 billion. All the new resources have been invested in social programs to benefit the majorities, large infrastructure projects, and benefits for the elderly, children, and pregnant women. Poverty has been reduced and the economy has grown steadily. Prior to Morales between 1999-2005, the economy grew 2.6% a year; between 2006-2012, growth was 4.8% a year. Every May 1 Evo Morales and his cabinet come with a message to the workers of the country – usually the recovery and nationalization of strategic companies that were privatized in the 90s. But today it comes with a different type of announcement. On May1, 2013, the Bolivian government decided to expel USAID (United States Agency for International Development), which has been frequently accused of political interference in peasant unions (sindicatos campesinos), and other social movements in order to conspire against the government. This May First is a highly symbolic day in Bolivia .USAID was the last US-based agency left in the South American country, after American Ambassador Philip Goldberg was declared persona non grata in September 2008. Goldberg was the architect behind a regional conflict between Bolivia’s western highlands and eastern lowlands. Goldberg was considered by Bolivian authorities an expert in encouraging separatist conflicts. He had clandestine meetings with rightwing political and separatist business leaders. Two months later, in November 2008, came the expulsion of the U.S. Drug Enforcement Agency, which was caught in flagrant conspiring activities. Dignity and sovereignty are terms frequently used by Bolivian President and social movements that support the Morales presidency. The expulsion of USAID strongly reflects that commitment.